Valentine’s Day. A day to celebrate love that’s turned into yet another excuse to waste spend money on stuff, just like Easter is all about chocolate and Christmas about presents. St. Valentine was the patron of love, young people and happy marriages – not of supermarkets and card shops (or abusive relationships if watching ’50 Shades of Grey’ is on your ‘to-do’ list this weekend!). I can recall scraping together one pound to buy my first boyfriend a mug with hearts on it when I was at secondary school, and remember the Valentine’s Days of my innocent youth receiving the occasional rose or card. When I met my hubby, we were in our early twenties and it seemed like we didn’t need Valentine’s Day to show our love. Being young and free, we ate out when we liked, bought each other cute gifts all the time and told each other we loved each other several times a day. But while we’re Valentine’s avoiders, we have always felt that it’s important to remember anniversaries and special days. It keeps you connected and is good to have your own traditions. So we do make a fuss of each other on our wedding anniversary in May and I received a beautiful emerald and diamond ring for our 15th last year. We also remember our ‘getting together’ anniversary (July 1997). It’s our day, not a day when everyone is battling to get into the shops and restaurants. Still, with Abi’s death on 10th February 2013, just four days before Valentine’s Day, we have found it impossible to even consider taking part in this event, not even with cards. Abi had a few admirers and the day after she collapsed a boy turned up on my sister’s doorstep and gave her a single red rose to give to Abi. The sentiment was heartbreaking, firstly we thought of this young lad, who had a crush on our girl and had plucked up the courage to deliver a rose to her aunt’s house. Then I remembered those days when love is young and innocent. My daughter was on the cusp of her youth and it was snatched away. I placed the rose on her bed in intensive care and it went in her casket too. Her first real valentine (even though she was more into another boy, this was still a valentine in the traditional sense). So as we recover from the emotional strain of her second anniversary, of course Valentine’s Day is here again. We were at the shops at the weekend and my hubby went and picked out a card, but then with my grief head on, I asked him to put it back as we don’t ‘do it’. We don’t need cards and flowers as the house is full of them for Abi’s anniversary. But I then I’ve been thinking about it ever since. Why not do it? Surely the fact he went and chose a card shows me another element of ‘moving on’ in a way with our grief as a couple? I am starting to feel we should do something. That by not doing it means we are neglecting us when we need to do everything to inject the love and happiness back into our lives. Buying a card won’t do that but it’s a sign to each other that we’re still there, we’re still committed, we still care. It’ll also send a positive message to our children that shows them how much Mummy and Daddy love each other (even if they do groan when we get soppy!). 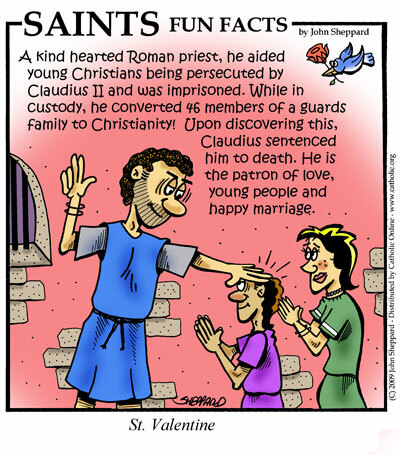 So St. Valentine, go on then… I’ll do it for the happily married! This entry was posted in Life with grief, Living and grieving, My musings about life, Special days and occasions, Uncategorized and tagged family, love, valentine's day by Chasing Dragonflies. Bookmark the permalink.